Alec Baldwin's President Trump opened this week's "Saturday Night Live" by reflecting on his first 100 days in office to Vice President Mike Pence (Beck Bennett), and thinking they were his final 100 days as well. "These 100 days have been such a success. I'm so sad my presidency is coming to an end," Trump says. Pence explains that, actually, Trump's got more than a thousand days left in his term, prompting the president to retort: "I don't know, have you seen my tweets about North Korea?" Trump's aggressive tweets toward the isolated nation appear to have contributed to escalating tensions. And just before "SNL"'s broadcast, U.S. military officials reported that North Korea had test-fired a missile, which exploded and failed to launch. Moving on, Bennett's Pence encourages Baldwin's Trump to resolve the ongoing reported infighting between advisers Stephen Bannon and son-in-law Jared Kushner. Rumors of discord between the two have been making headlines for the past few weeks, particularly since once-top Trump adviser Bannon was booted from the National Security Council. Word has been that Bannon's nationalism wasn't jibing with the idealogies of others close to Trump, like Kushner. So Baldwin's Trump calls both Bannon and Kushner into the Oval Office to sort things out. 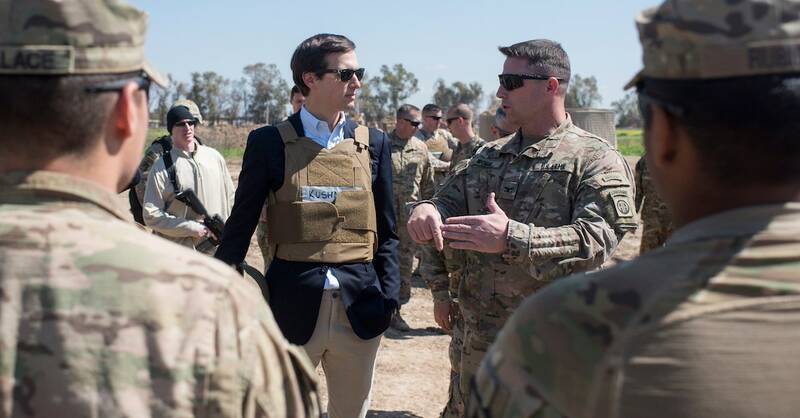 Jimmy Fallon replicated Kushner's now-infamous outfit from his visit to troops in Iraq — and enters the room to EMF's "Unbelievable," while Bannon appears as a silent skeleton from hell. "There's been a lot of drama in the house," Trump tells the two men. "But one of you has to go. It's elimination night." Fallon, host of "The Tonight Show" on NBC and former "SNL" cast member, returned to host Saturday on the show's first-ever truly live-from-New-York broadcast — viewers from coast to coast in the U.S. and Canada were able to tune in simultaneously to watch the program as a shared television experience. Fallon opened by leading a massive lip-synch flash mob to David Bowie's "Let's Dance." It made sense for Melissa McCarthy to return this week to play Sean Spicer: The real-life White House press secretary made a serious gaffe during his daily briefing Tuesday in saying that Nazi leader Adolf Hitler, who used chemical weapons in systematically killing millions of people as part of the Holocaust and his "Final Solution" of ethnic cleansing, "did not sink to the level of using chemical weapons." Spicer's remark, which came on the first day of Passover, immediately generated outrage on social media and drew harsh criticism from officials on both sides of the aisle. And as the press secretary tried throughout that day to clarify his remarks, he only seemed to make things worse, incorrectly referring to Nazi concentration camps as "Holocaust centers," for example. Finally, by the day's end, Spicer appeared contrite, publicly apologizing via various news outlets. "We all make mistakes," he told NBC News, and he said he hoped that he could be forgiven. So McCarthy's clearly unhappy Spicer takes the podium — wearing an Easter bunny suit. "Spicey finally made a mistake," he says, frustrated and sweaty from the costume. The bunny suit is a good fit — not only because the show aired the night before Easter Sunday, but because, during the George W. Bush administration, the real Spicer actually played Easter Bunny at the White House's Annual Easter Egg Roll. "Happy Easter, everybody," McCarthy's Spicer says, wrapping up the briefing and climbing into an Easter egg car. "Oh, and by the way," he adds, "the president is probably going to bomb North Korea tonight" — a reference both to hostile U.S.-North Korea relations and to Trump's recent use of force in Afghanistan and Syria. "So eat as much candy as you want," Spicer says, "because this is probably our last Easter on earth." Then he drives the egg car into the podium. On mainstay sketch "Family Feud," hosted by Kenan Thompson's Steve Harvey, Fallon takes on the role of two separate John Travoltas while musical guest Harry Styles impersonates the distinctive moves of a rock icon. Former "SNL"er Rachel Dratch returned to join Fallon for a revival of their characters, Sully and Denise from Boston. In a short sketch near the top of the program, a young woman (Cecily Strong) rejects the advances of an ex-boyfriend (Fallon). Eventually, we find out why she won't have him back: "You dragged someone off a plane this week!" she yells, referring to the United Airlines passenger who was forcefullly dragged off a plane because he'd refused to relinquish his seat to make room for airline employees on a sold-out flight. Shocking video and images of the man taken by other passengers provoked public outcry and forced the airline's CEO to make a series of increasingly apologetic public statements. Ahead of the May release of his self-titled debut solo album, Harry Styles of 1 Direction performed two songs: "Sign of the Times" and "Ever Since New York."